The Transformers is an American media franchise based on a series of rebranded Japanese toys (“Microman and Diaclone”). The series is produced by the American toy company, Hasbro, and centers around two warring factions of alien robot warriors marooned on the planet Earth. In its decades long existence, the franchise has had many adaptions in comic books, television shows, video games and movies. Our write-ups specifically cover the first 12 issues of the “Generation 1” comics series. It was produced by Marvel Comics between the years 1984 and 1993. 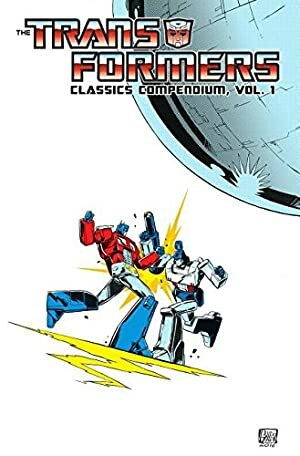 In this version, the Transformers found themselves trapped on the Earth in the Marvel Universe. The series had brief cameos from Spider-Man, G.I. Joe and even visited the Savage Land. 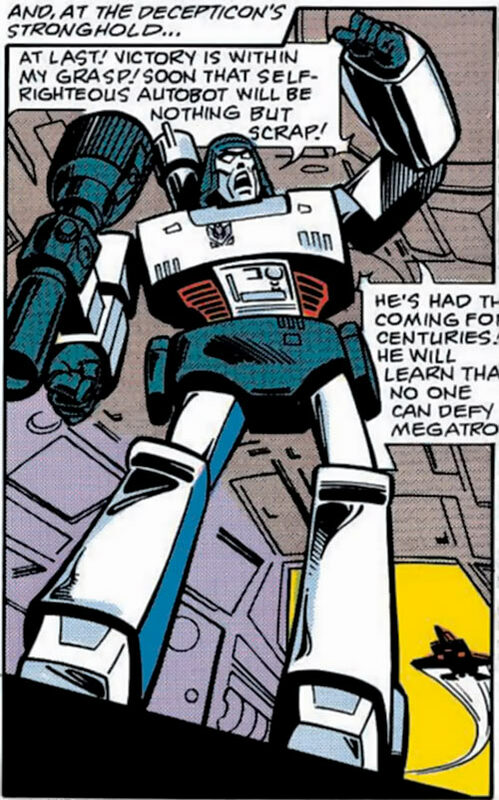 Megatron is one of the iconic villains of the 80’s. He had a world-class visual design (which was altered later on in the series … more than likely due to the fact that people grew uncomfortable with children wielding “realistic” guns during play), a terrifying personality, and was physically powerful enough to present a true challenge to any foe his faced … short of Prime. Height: Approx 21′ Weight: Several Tons. Can lift weights in the “Class 75” range. Cannot be harmed by any form of conventional military weaponry. Is immune to all forms of human frailties (i.e. aging, sickness, disease, hunger, fatigue, etc.). As a Cybertronian, Megatron is extremely hard to kill. Even if his body was smashed to pieces, it would be possible to revive him after he was repaired. 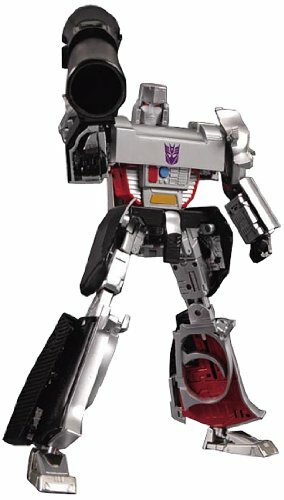 Like all other Transformers, Megatron can reconfigure his body into a secondary form for the purpose of disguise. 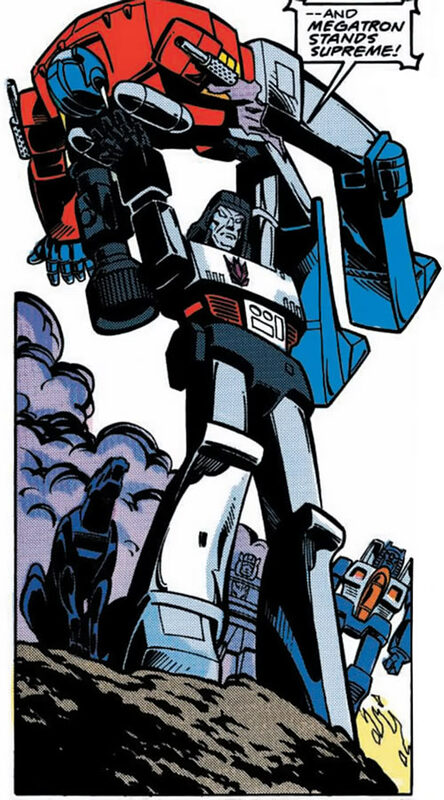 In his case, Megatron transforms into a human-sized P38 handgun (complete with a scope, stock and rifle barrel). He retains his intelligence and capacity for speech in this form, but in all other ways he is a gun. Megatron has vast military experience, gained from participating in numerous military operations. He is a capable strategist and leader. 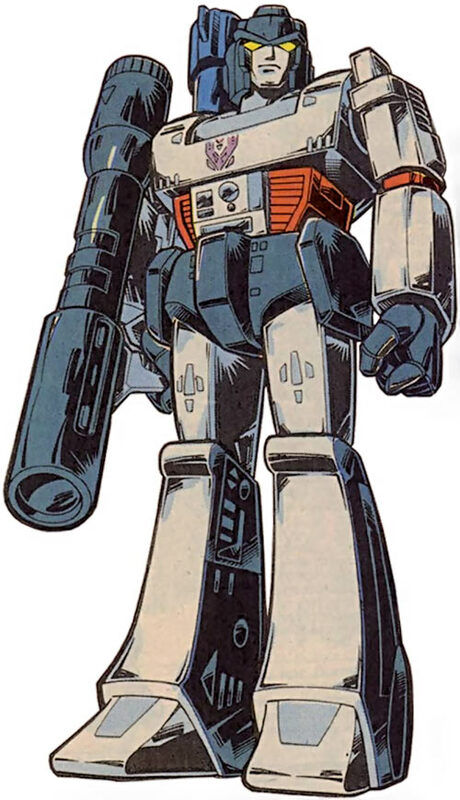 While he is a seasoned melee fighter, Megatron prefers to use the massive fusion cannon mounted on his harm in battle. This weapon is so powerful that it is said to be capable of levelling a small town with a single blast. Worse still, it has an effective range of 12 miles. Millions of years ago, life evolved on the planet Cybertron in the form of sentient robots. 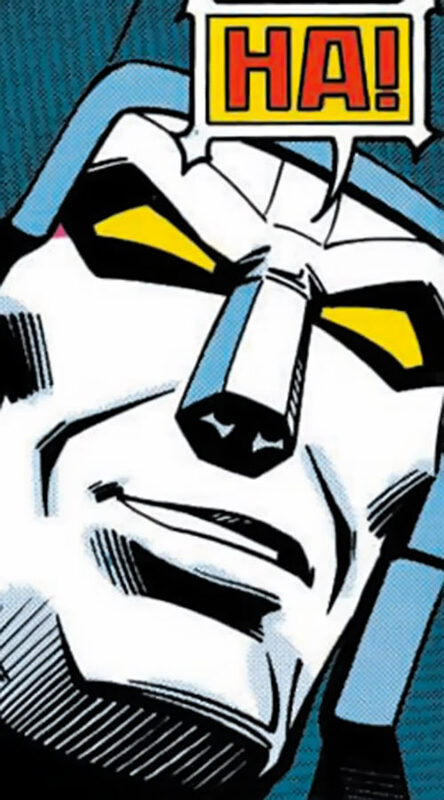 The “Autobots” lived in peace until the day Megatron was born. Unlike his peers, Megatron craved power and the glory of conquest. Soon after his creation, Megatron began to preach his ideology to any that would listen. Over time, Megatron recruited many followers. Together, they plotted the conquest of Cybertron. Megatron in gun form. Say U.N.C.L.E. ! Once their plans were firm, the Decepticons attacked the peace-loving Autobots. The initial assault killed many Autobots. But the survivors fought back and stemmed the Decepticon attack. Thus the thousand year war began. A war so fierce that the planet itself shook loose from its orbit. The Autobots nearly lost the war in its early days despite their exceptional valor. The Decepticons had planned their attack too well. And Megatron’s awesome power turned the tide of many battles. All seemed lost, until Optimus Prime rose to power. Optimus was wise and overwhelming powerful. In every way, he was Megatron’s equal. Thus, his presence actually changed the course of the war. In a few short months, the Autobots reversed their fortune under Optimus’ leadership. The war continued for centuries until Cybertron crossed the path of an asteroid belt. To save their planet, Optimus led a group of Autobots into space to clear a path through the asteroid belt. One of Megatron’s spies relayed Optimus’ intentions to Megatron. In response, Megatron took his own ship into the darkness of space. There, he laid an ambush for the Autobot forces. He waited for them to spend their strength on the asteroids before starting his assault. The Decepticons stormed the Autobot ship and slew all they encountered. In the end, only Prime remained. Left with little choice, he pointed the ship (the Ark) at a nearby planet. Then he triggered the ship’s drive. The Decepticons could not escape the ship before it struck the Earth with the force of a large meteor. He (and all those who remained aboard) “died” on impact. The Ark lay inert under Mt. Saint Hillary for millions of years. This changed in 1984, when the volcanic mountain finally erupted. The eruption woke the Ark’s main computer, which launched a drone. The drone gathered data on what it assumed were the Earth’s dominant lifeforms. Machines. Once it had enough information, it sent the data back to the Ark. The Ark then rebuilt the Cybertronians in the image of the machines that the probe had sent. Upon awakening, Megatron ordered the Decepticons to retreat. He knew that without the advantage of surprise, it was very possible that his forces would lose. Megatron ordered one of his spies to watch over the Autobots while he plotted his next move. Soon, his spy reported that the Autobots were making contact with Earth’s inhabitants. Megatron ordered the Decepticons to attack to prevent the Autobots from gaining allies. The Decepticons failed to stop the Autobots from making allies that night. The Autobots befriended Sparkplug and Buster Witwicky as a result of that battle. Sparkplug (a mechanic) devised a method that turned gasoline into Cybertronian fuel. The Decepticons attacked the Autobots at Sparkplug’s garage to prevent them from refuelling. Megatron himself led the attack. When the dust had settled, the Decepticons managed to escape with the human mechanic. Megatron took Sparkplug to his nearby makeshift fortress. The Autobots (and Spider-Man) assaulted the fortress and rescued Sparkplug. Unfortunately, the rescue came too late. Sparkplug had already revealed his secret of fuel conversion to the Decepticons. While the Autobots retreated with the human, the Decepticons refuelled themselves. They then attacked the Ark en masse. When they arrived they found Optimus Prime and four of his strongest allies waiting for them. Optimus took what little fuel the Autobots had left to refuel the five Autobots. It mattered little. With their greater numbers, the Decepticons defeated the Autobots. 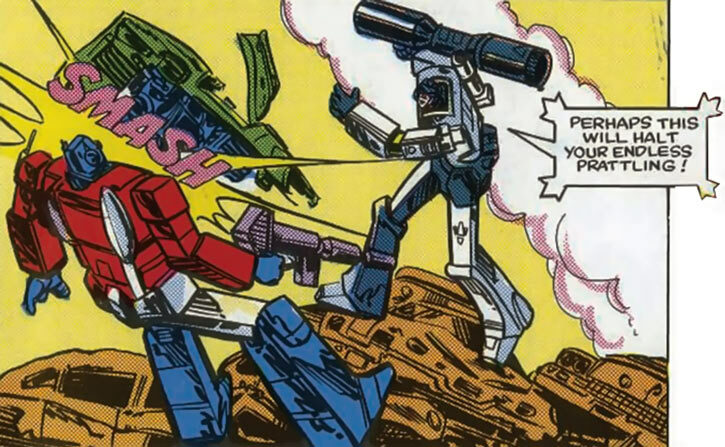 Megatron himself dealt the final blow to Optimus Prime. Megatron took a few moments to savour his victory and gloated instead of finishing off his foes. Those moments cost him. As he launched his final strike, he struck by an intense pain that lanced through his body. Sparkplug had outthought Megatron. He gave him a formula that would corrode their interior components after a period of time. Seconds later, the Decepticons dropped inert to the ground. When Megatron next awoke, he found himself under repair in the Ark. While he was unconscious, Shockwave had defeated the Autobots. Moreover, his former second-in-command had seized control of the Decepticons. Megatron was furious at Shockwave’s impudence. Unfortunately, he could not even move due to the damage he sustained from Sparkplug’s fuel. Left with little choice, Megatron watched and waited while Shockwave led the Decepticons. Megatron’s patience lasted the exact amount of time it took him to recover his mobility. The instant he could move he shattered the medical restraints that held him immobile. Once he was free, he attacked Shockwave with his full strength. Unfortunately, he attacked too early. His repairs were incomplete, and Shockwave used it against him. After a brief skirmish, Shockwave defeated Megatron. He then forced Megatron to swear loyalty to him, cementing his command of the Decepticons. Megatron guarded the Ark while Shockwave advanced his plans for world conquest. It was in this role when he encountered the Autobot medic, Ratchet. Ratchet had infiltrated the Ark in the attempt to free the captive Autobots. Ratchet had been sneaking about the Ark when he ran into Megatron. The two fought. Megatron, being far stronger than Ratchet, battered him about for a few minutes. When he grew bored, he prepared to destroy the Autobot. At that moment, Ratchet claimed to have a method to destroy Shockwave. He proposed that if he did so, that Megatron would free the Ark and Autobots. Megatron, lusting for revenge on Shockwave, agreed to Ratchet’s terms. Days passed while Megatron waited for Ratchet to enact his plan. During that time, Shockwave returned. He then took Optimus Prime to his new base of operations. Soon thereafter, Ratchet transmitted a video of the Dinobots defeating Shockwave. With Shockwave defeated, Megatron abandoned the Ark to seek Ratchet. They met on the mountain top of a nearby ski resort. When he arrived Ratchet proclaimed that he held up his part of the bargain. In reply, Megatron attacked. Ratchet, expecting Megatron’s treachery, turned the Dinobots on Megatron. The five Autobots attacked Megatron. But they could not overpower the former Decepticon leader. Megatron made short work of the Dinobots, then turned to taunt Ratchet. He goaded the medic into attacking him. Ratchet, feeling that he had no choice complied. He charged at Megatron and struck him with his full weight. He had hoped to carry both of them over the mountainside to their deaths. Instead, Megatron did not even move. He shrugged off the tackle and laughed at the Autobot’s despair. What he failed to realize that the force of the blow had transferred to the ground beneath him. While he laughed, the it crumbled underneath him. Dumbfounded, Megatron fell from the cliffside. He fell miles to a the ground below where he disappeared under tons of snow and rock. Like Optimus Prime, Megatron is a massively built, semi-humanoid robot. He towers over his fellow Decepticons; he is nearly 20 feet tall. He has a massive has a thick barrel-like chest and long powerful legs. The majority of his body is a metallic silver/gray colour, while his hands, trunks and head piece are grayish black colour. Megatron is a bitter, brutal, thugish being. He constantly seeks opportunities for conflict and battle. He has no capacity for love or compassion. Nothing brings him pleasure other than the act of crushing weaker opponents and claiming their possessions as his own. Conquering a single planet will not satiate his desire for conquest. His thirst for battle pushes him to seek out victims throughout the known universe. Despite this brutish behaviour, Megatron can be quite charismatic, intelligent and cunning. He exploits every advantage that he has in a situation and rarely engages an enemy on equal footing. Treachery is second nature to him. He routinely exploits his enemies sense of honour in order to gain the upper hand in their encounters. Ultimately, Megatron is a bully. He enjoys tormenting creatures that are weaker than him. He will often play with his wounded foes instead of slaying them quickly. In many ways, this over confidence is his only weakness. 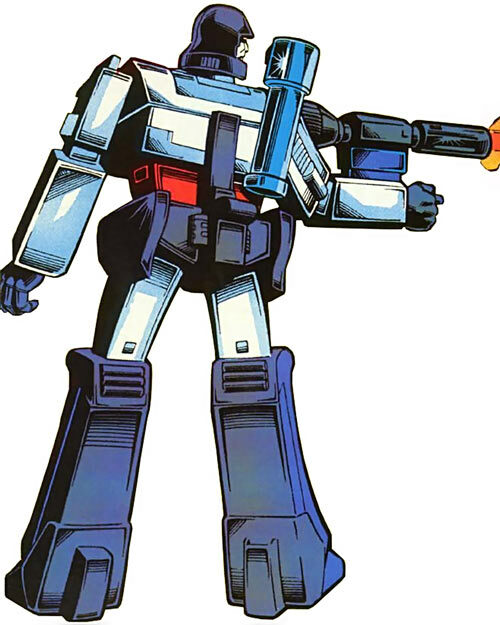 Self-Link (Gadgetry) is Always On and makes Megatron a Robot (-1FC). Self-Manipulation can only be used to assume the form: P38 [Projectile Weapon: 18, Telescopic Vision: 02] (-1FC). Exile (Involuntary), Mistrust, Strange Appearance. Characters with this advantage are inorganic beings and must be repaired (via Gadgetry rolls) instead of receiving medical treatment. Repair attempts can be made on these beings even after death. In this case, the AV will be the APs of Gadgetry the mechanic possesses and the RV being the absolute value of the Cybertronian’s BOD. Positive RAPs are applied to the patient’s BOD score.